Map of Southeast Asia, showing Vietnam and its neighbours. 1. According to the official name and 1992 Constitution. Vietnam is a country in Southeast Asia. The long-form name of the country is the Socialist Republic of Vietnam. The neighboring countries of Vietnam are China, Laos, Cambodia, and the Philippines. In Vietnam the approximate population is 90,549,390. 25.2% of these people are aged between 0-14, with 11,954,354 being male and 10,868,610 female. 69.3% of the population are between the ages of 15-64. The male-to-female ratio is almost evenly split with 31,301,879 being male and 31,419,306 being female. 5.5% are 65 and over and the ratio is 1,921,652 are male and 3,092,589 are female. So with the older two categories women are more populated. The population is not from one origin. There are many ethnic tribes that developed in the history of Vietnam. This makes Vietnam's history and culture very diverse. It's not the same as a country where every family landed on the country's shores in the same century. French and Chinese colonization didn't involve an excessive migration of people to Vietnam. Nowadays, the blend of cultures has been increasing with the influence of globalization and world interest. Many Vietnamese that have been living overseas are described as the Viet Kieu. The Viet Kieu population has several communities in many countries around the world. Vietnam is famous for its ancient civilization and some of the world's most ancient and important monuments, including the Huế's Forbidden City and the Hội An Ancient Town; the southern part of the country contains a particularly large number of ancient artifacts such as the Mỹ Sơn Holy Land and the Óc Eo Citadel. About 5000 years ago, the two ethnic tribes of the Lac Viet and Au Viet lived together in many areas with other inhabitants. Due to increasing needs to control floods, fights against invaders, and culture and trade exchanges, these tribes living near each other tended to gather together and integrate into a larger mixed group. Among these Lac Viet tribes was the Van Lang, which was the most powerful tribe. The leader of this tribe later joined all the tribes together to found Van Lang Nation in 2897 BC, addressing himself as the King Hung. The next generations followed in their father's footsteps and kept this appellation. Based on historical documents, researchers correlatively delineated the location of Van Lang Nation to the present day regions of North and north of Central Vietnam, as well as the south of present-day Kwangsi (China). The Van Lang Nation lasted to the 3rd century B.C. The Dong Son civilization that covered much of Southeast Asia was also the beginning of Vietnam's history. In 221 BC, the Qins invaded the land of the Viet tribes. Thuc Phan, leader of the alliance of Au-Viet tribes managed to expel the enemies and declared himself King An Duong Vuong and his territory Au Lac Nation (257-207 BC). In 208 BC, a Qin Dynasty general named Triệu Đà invaded Au Lac. An Duong Vuong failed this time. As a result, the northern feudalist took turns dominating the country over the next eleven centuries, establishing their harsh regime in the country and dividing the country into administrative regions and districts with unfamiliar names. However, the country's name of Au Lac could not be erased from the people's minds in their everyday life. In 207 BC Triệu Đà established a state called Nam Việt which encompassed southern China and the Red River Delta. The historical significance of the original Nam Việt remains controversial because some historians consider it a Chinese occupation while others believe it was an independent era. For most of the period from 111 BCE to the early 10th century, Vietnam was under the rule of successive Chinese dynasties. Sporadic independence movements were attempted, but were quickly suppressed by Chinese forces. When it was ruled by the Chinese Empire for many hundred years, it was called Annam ("peaceful south"). Cochinchina is shown on the eastern coast of this 1886 map of Indo-China. In September 1858, France occupied Đà Nẵng. Cochinchina was a French colony from 1862 to 1948. In 1930 Nguyễn Ái Quốc established the Vietnamese Independence League (Việt Nam Ðộc Lập Ðồng Minh Hội) which is also known as the Việt Minh. The Japanese took over Vietnam in World War II. The Việt Minh fought against both the Japanese and the Vichy French. When the Japanese were defeated, the Vietnamese people, led by the Việt Minh started the August Revolution. On September 2, 1945, Nguyễn Ái Quốc (who was now calling himself Hồ Chí Minh, meaning 'Hồ (a common last name) with the will of light') read the Declaration of Independence of the Democratic Republic of Vietnam in Ba Ðình Square, in Hànội. It was based on the American Declaration of Independence. Hồ Chí Minh led the Việt Minh in a war for independence from France. The "Autonomous Republic of Cochinchina" (République Autonome de Cochinchine) was proclaimed June 1, 1946 to frustrate the Việt Minh's desire to rule all of Vietnam. The War between France and the Việt Minh lasted from 1946 to 1954. The French were defeated in 1954 after the Battle of Dien Bien Phu. The nation was then divided into North Vietnam and South Vietnam. After independence was achieved, the French gave the land of the Mekong delta that was part of Cambodia to South Vietnam. The anti-communist United States had a lot of influence in the South, and the communist and nationalist Việt Minh controlled the North. Hồ Chí Minh was extremely popular in the whole nation, as he was the only remaining leader after years of fighting, so he became President of the Democratic Republic of (North) Việtnam. It was agreed that the nation would be reunited by elections in 1956. But, the Americans and the Southern government stopped the elections from happening because they expected Hồ Chí Minh to win because communist North Vietnam refused to hold free elections. Dwight Eisenhower said he thought Hồ would win with around 80% of the vote if elections were held because of the majority of the population being in the north added with Ho's few supporters in the South. Soon, the USA was at war with Vietnam. This war was known as the American War, the Vietnam War, or the Second Indochinese War. Soon, South Vietnam became a military dictatorship with some basic freedoms. The Southern army removed the controversial Ngo Dinh Diem from power and killed him. On September 2, 1969, Independence Day, President Hồ Chí Minh died of heart failure. People all across the nation cried for him. Even the Sàigòn newspaper said, "Việt Nam loses a unique politician" since this man had fought for freedom from their Japanese and French rulers. On April 30, 1975, the National Liberation Front with the help of the N.V.A. overtook Sàigòn and quickly renamed it Hồ Chí Minh City. The nation was fully reunified as Socialist Republic of Vietnam on July 2, 1976. Vietnam is divided into 58 provinces. There are also five city municipalities which have province authority. 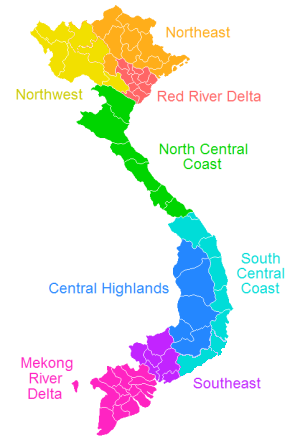 The provinces of Vietnam are divided (by the government) into provincial cities and provinces. ↑ Robbers, Gerhard (30 January 2007). Encyclopedia of world constitutions. Infobase Publishing. p. 1021. ISBN 9780816060788 . http://books.google.com/books?id=M3A-xgf1yM4C&pg=PA1021. Retrieved 1 July 2011. ↑ 4.0 4.1 4.2 "Vietnam". International Monetary Fund. http://www.imf.org/external/pubs/ft/weo/2010/01/weodata/weorept.aspx?sy=2007&ey=2010&scsm=1&ssd=1&sort=country&ds=.&br=1&c=582&s=NGDPD%2CNGDPDPC%2CPPPGDP%2CPPPPC%2CLP&grp=0&a=&pr.x=71&pr.y=7. Retrieved 21 April 2010. ↑ "GDP năm 2010 của Việt Nam vượt 100 tỷ USD". Vnexpress.net. 29 December 2010. http://vnexpress.net/GL/Kinh-doanh/2010/12/3BA24D1C/. Retrieved 6 August 2011. ↑ "Human Development Report 2010. Human development index trends: Table G". The United Nations. http://hdr.undp.org/en/media/HDR_2010_EN_Table1.pdf. Retrieved 5 January 2011. ↑ "CIA The World Fact Book". https://www.cia.gov/library/publications/the-world-factbook/geos/vm.html. Retrieved 10-05-2011. Parts of this article were created based, in whole or in part, on this version of the English Wikipedia article on Cochinchina. This page was last changed on 19 December 2014, at 11:41.